Click here to watch the amazing slideshow by the amazing Kate Kelly! Thank you Katie and to everyone who came in support of Aaron, Sierra, the boys and I. A big thank you to Butterflies and Prayers for donating the butterflies we released in their honor!!!! I had the pleasure of FINALLY taking photos of my good friend Kristie's family! Her daughter Avrie is already six months and we have been talking about taking photo's for months! We ended up taking the photos in my backyard. An amazing backdrop thanks to my husband Aaron! The first photo is my favorite! She was such a good baby and it was nice to meet Andrew. I must say Kristie is a lucky girl. Well I guess they are both very lucky! Click here to watch the slideshow! 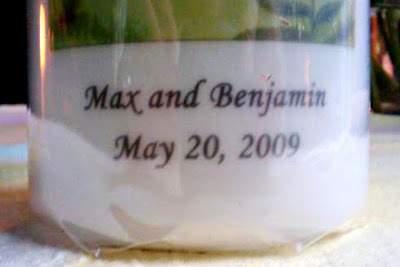 Max and Benjamins heavenly 1st birthday! Well today is the day that I have been dreading since their birth. I am not sure why, I guess because this last week has brought back so many memories. Some good, some......well really not so good! It took me a long time to be able to think back to the evening leading up to their birth. Well that day was officially one year ago. Happy heavenly birthday Max and Benjamin. There is not a day that goes by that we don't think of you! I am doing better than I thought, I have only cried three times so far today! I think my crazy hormones are playing a roll in that one. We are having a dinner with close family and friends tonight in their memory. We are also doing a butterfly release and lighting the special candle that we got from sweet Nan! I don't want it to be sad but a celebration of their very short time on this earth. It gives me true comfort to know that they are in heaven and god has a plan. I can just see the boys smiling down at us, sitting with Frank and my Grandparents I'm sure! We can't thank you enough for all the love, support, friendship and compassion that everyone has given us over this past year. I got through many a tough times with one or all of you! 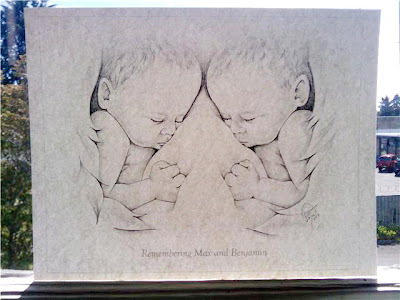 This angelversary has forced me to make their memory box as well as a slideshow of my pregnancy. Two things I have wanted to do this past year but never had the heart to finish. Click here to watch our slideshow! Aaron, Angie, Sierra, Max, Benjamin and Baby Tabaczynski due November 10, 2010! I got this beautiful sketch from Tina today! She had it made by "portraits by dena". Just in time for my boys angelversary tomorrow! Another very very thoughtful gift from a dear friend! Like Nan and myself Tina lost her girls last year and has been a great support to me over this past year. The three of us don't let a week go by without checking in on each other! Thank you for thinking of me, my family and my boys especially this week! Oh and both are pregnant again with little girls!!! Tina is due next month and Nan is due in July. I can't wait to see those little ones!!! 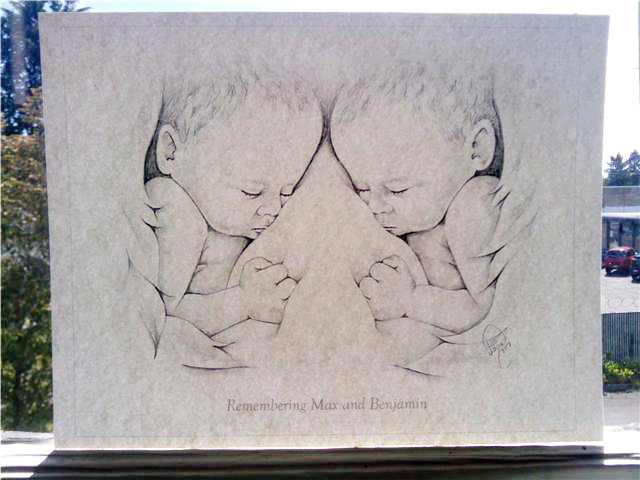 I came home last night to find a gift mailed to me by my dear beautiful friend Nan! I couldn't wait to open it and had NO idea what it could be. She asked me for my address last week and I completely forgot about it. 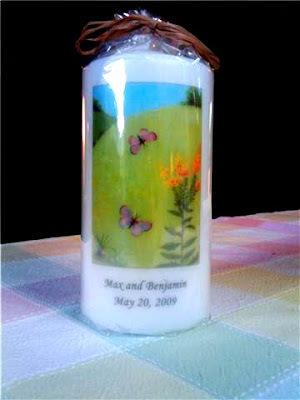 Look at the beautiful candle she had made for me and my family in honor of our boys! Thursday markes the boys 1st heavenly birthday. Aaron and I are very excited to light it once every year! Nan I can't tell you how special this is to me. THANK you for a year of support, understanding and friendship! I hope I was there for you like you were there for me!